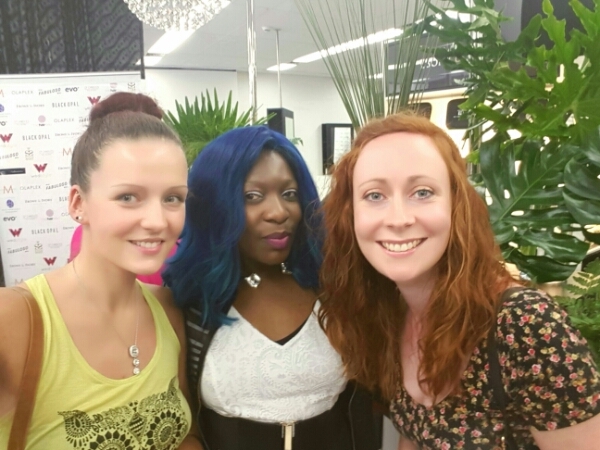 Ms. D and I had the pleasure to attend a fabulous Creative Masterclass hosted by Joan Dellavalle of Ebony & Ivory. We arrived at the salon and were greeted at the door, photo taken and a drink order taken. We took a seat and awaited the start of the class. 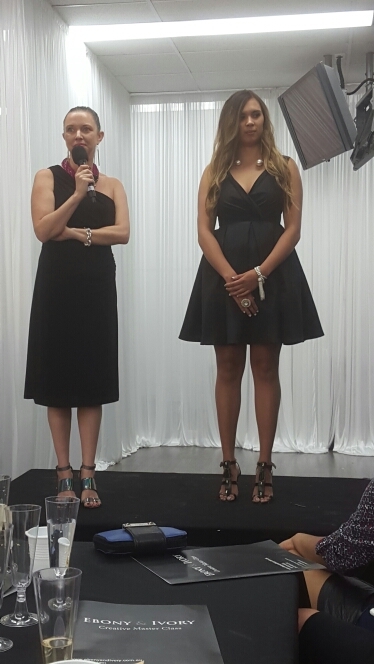 The masterclass was hosted by Melanie Pool, CEO Founder of Australian Fashionistas. As the team from Ebony & Ivory started the first demonstration, Mel invited attendees to ask questions about their hair problems/issues which the team answered in detail. These ladies clearly know what they are talking about. ▪How to curl your hair yourself using a large barrel curling iron. 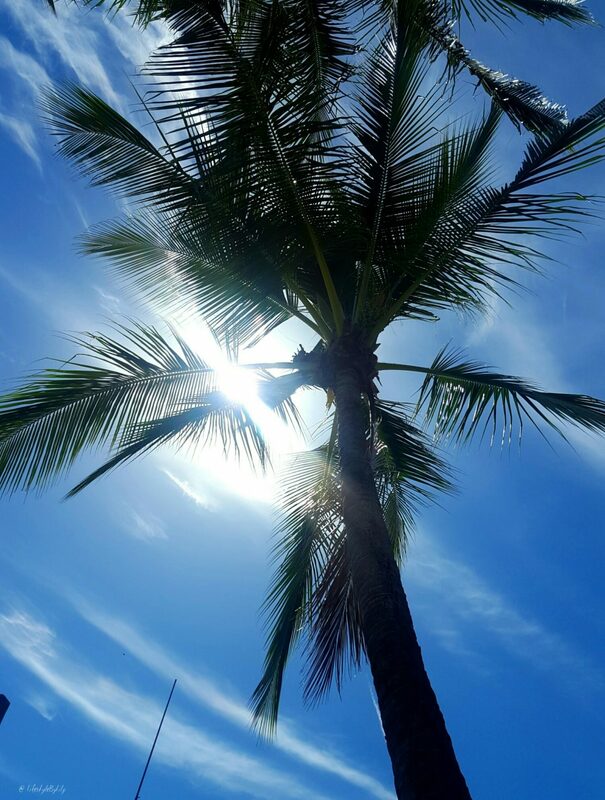 ▪2016 will carry through the ombre look and bring new techniques to achieve the look. ▪Joan didn’t recommend the Brazilian treatments due to the ingredients used. ▪Hair Burst is a natural way to encourage hair growth as it contains the vitamins to grow the hair and the vitamins to back these up. ▪OLAPLEX is an investment product used to improve the condition of your hair and treat it to maintain healthiness. 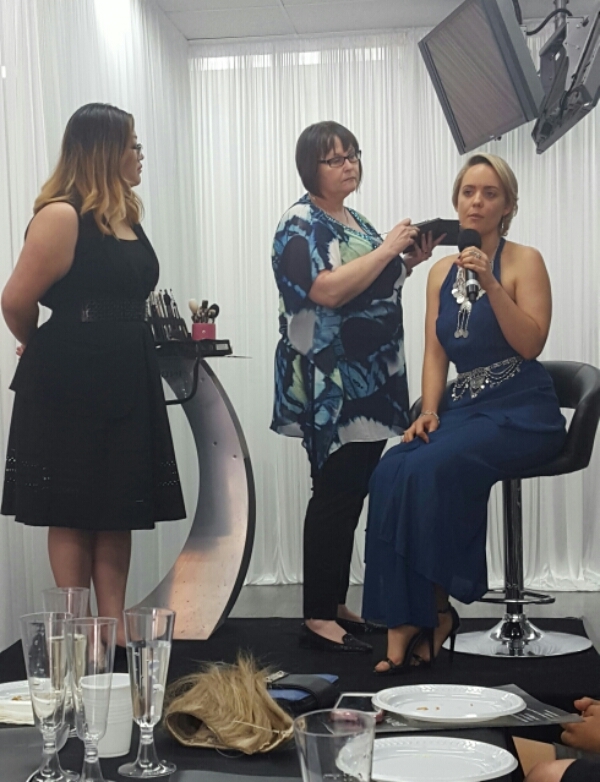 We then moved to a make up demonstration by Vikki Aldridge on tv famed Louise Pillidge. 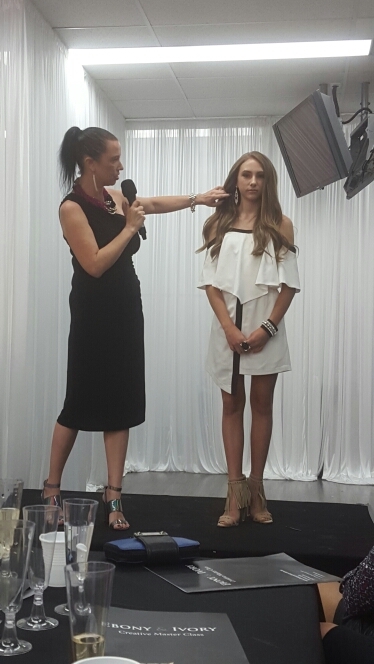 Vikki is a freelance make up artist for Channel Nine Perth and Channel Ten Perth with experience in television, special effects, bridal and many more. Vikki was assisted by Mandy To who helped to answer questions from the attendees. Mandy is a former accountant with six years experience in the make up industry. The MUAs answered questions on finding your foundation, recommended primers, how to apply false eye lashes and creating perfect brows. 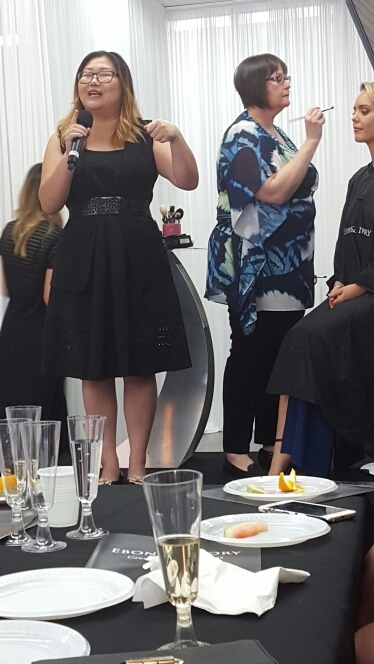 Even though Vikki found it hard to talk over Louise who rambled on throughout the make up application, she still managed to talk us through some of the products she used and demonstrated her love of a natural make up look. Watching Vikki apply make up, makes it look so easy! As many of us agreed, it seems a lot harder to do this ourselves in our bathroom mirrors, if only it was as easy as it looks! She recommended practice, no one is born a professional but practice will get you there a little quicker. Next to the stage was Karen Drummond who showcased a day, casual and cocktail look on Louise Pillidge. She also styled the fabulous outfits for the hair models. Karen is an international fashion stylist with tv,runway and editorial experience. She was also talked over by Louise but still managed to share where the pieces were from and a few current trends. ▪Invest in a good jacket. ▪Statement jewellery pieces can take an outfit from day to night. ▪Pieces with tassels are very in! My favourite pieces were the shoes, I won’t ever stop adding to my collection! We each received a great goodie bag with gifts which I cannot wait to try out! The Creative Master Class was wrapped up with an emotional thank you from Joan. You can really tell Joan values those she works with and runs a business to enhance skills and careers. She’s the kind of lady I want to work with! Joan hopes to continue her Creative Master Classes so keep an eye out for the next one as you will learn a lot from her and her team. Thank you so much to this fabulous blue-haired lady, Joan, and her team for a fantastic afternoon packed with learning and networking. Thank you to those who contributed to our fabulous goodie bag! 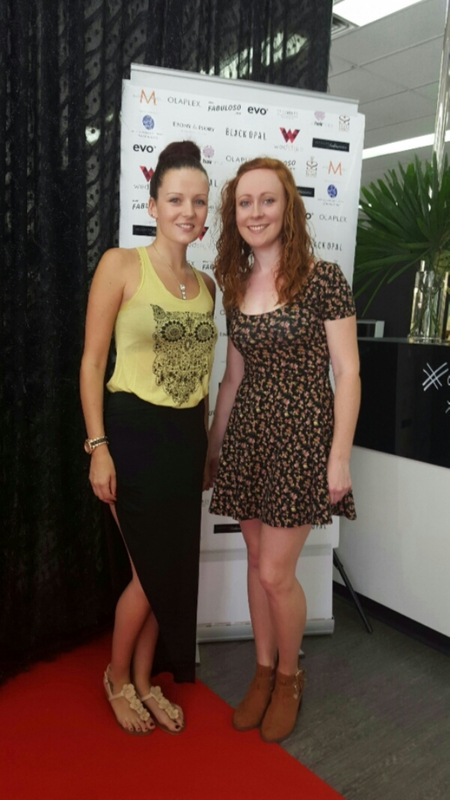 You can book a trip to Ebony & Ivory which is located at 25 Barrack Street, Perth by calling 08 9325 4001. Sounds like a fun event! I love getting beauty tips from the experts.